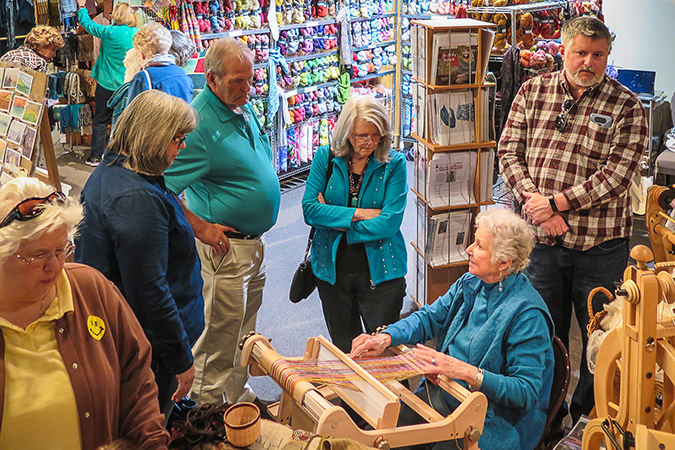 TOWNSEND, TN – The tenth annual Smoky Mountain Fiber Arts Festival is set for April 12-14, 2019, at Great Smoky Mountains Heritage Center in Townsend. The weekend event, organized by the Townsend Artisan Guild, offers 43 instructional classes by fiber arts professionals, family activities, demonstrations, live animal displays such as alpacas, llamas, angora rabbits, sheep and goats, and the always-popular Marketplace of Vendors. “The 40 vendors come from East and Middle Tennessee, Georgia, North Carolina, Virginia, Indiana, and beyond. Thirty-one vendors are returning, including Andy’s Treasures, Hickory Bluff Farms, Liles Acres Organic Farm, Saddle Brook Farm, Smoky Mountain Spinnery, and Stony Hill Fiber Arts who have participated in all ten of the Festivals. Nine new vendors will display their fibers, tools and finished products. All will be sharing their expertise and demonstrating tools and techniques during the festival. Two-thirds of the 43 classes are new for 2019. Popular instructors are returning, including Jennifer Bennett, Geri Forkner, Nancy Shedden who have been successfully instructing fiber artists and hobbyists for all ten years of the Festival. Five instructors are new to the event. Classes include hands-on instruction of the total processes. From fiber preparation to dyeing to spinning and then creating through crochet, embroidery, felting, knitting, tapestry, weaving, and more. Classes are kept small for individual attention and most are designed to complete a project during the class time. On Saturday, April 13, 12:00, the Festival will host a Fashion Show where the vendors, instructors, students, and participants will have an opportunity to display their creations. This was a popular addition last year, especially when the alpaca with her scarf decided to lead the parade. Visit www.smokymountainfiberartsfestival.org for a complete list of classes. Early registration for classes is encouraged. The 2019 Smoky Mountain Fiber Arts Festival is presented by the Townsend Artisan Guild, the Tennessee Valley Handspinners Guild and the Scenic Valley Weavers Guild and supported by the Arts and Culture Alliance of Greater Knoxville, the Blount Partnership, and the Tennessee Arts Commission. The Townsend Artisan Guild, founded in 2007, brings fine artists and fine crafts persons together to promote education and development of arts. The group, through the individual participation of its members, strives to promote community interest in and appreciation of the arts through participation in events, demonstrations, classes, festivals, and workshops. The Guild provides member artists opportunities for self-promotion through art shows, exhibits, community activities, and printed and electronic means. Monthly meetings and other events provide members a creative forum to share ideas, to inspire others, and to explore business realities. In 2015, the Guild opened its own Gallery to exhibit and sell the original works of its artists. The Gallery is open Tuesday-Saturday, 10am-5pm and Sunday, 1:30pm – 5 pm and is located at 7719 East Lamar Alexander Parkway in Townsend.